This is one of my favorite meals to cook and eat. Chicken fingers and Mac & Cheese are the epitome of comfort food, but these recipes have much more flavor and nutrition than the average kid’s meal. To round out the meal add a Caesar salad and your favorite glass of wine; instantly it becomes a dinner that leaves an impression. Create brine by mixing 1 cup water with 1 tbl of salt and sugar, stirring until dissolved. Put chicken fingers and brine in a quart sized zip top bag and place in the refrigerator for at least 45 minutes, up to over night. Preheat oven to 400 degrees. Mix salt, sesame seeds, onion, herbs and pepper in a small bowl. Drain the brine out of the bag, easiest way: cut a small hole in the bottom of the bag. Coat the chicken with the herb mixture and arrange on a baking sheet prepared with non stick spray. Bake for about 18 minutes until internal temperature reaches 160 degrees. For a special dipping sauce, mix 2 tbl ketchup, 3 good shakes Worcestershire sauce, garlic powder, cayenne pepper and salt/pepper to your taste. This adds an extra little kick to the tenders and is one more special element on the plate. Bring a pot of water to a boil and cook pasta according to package al dente directions. Melt butter in a large sauté pan over medium high heat, whisk in flour, and cook for about 3 minutes until just gaining color then stir in chicken stock. Continue whisking and bring to a simmer, add milk and nutmeg, reduce heat to medium and simmer until reduced stirring occasionally, about 7 minutes. Add in a cup of cheese; the type doesn’t really matter, use whatever you like and have on hand. I combined 3 varieties, leftovers from earlier in the week: brie, cheddar, and parmesan. Once cheese is melted stir in pasta, bring mixture to a simmer and serve immediately. 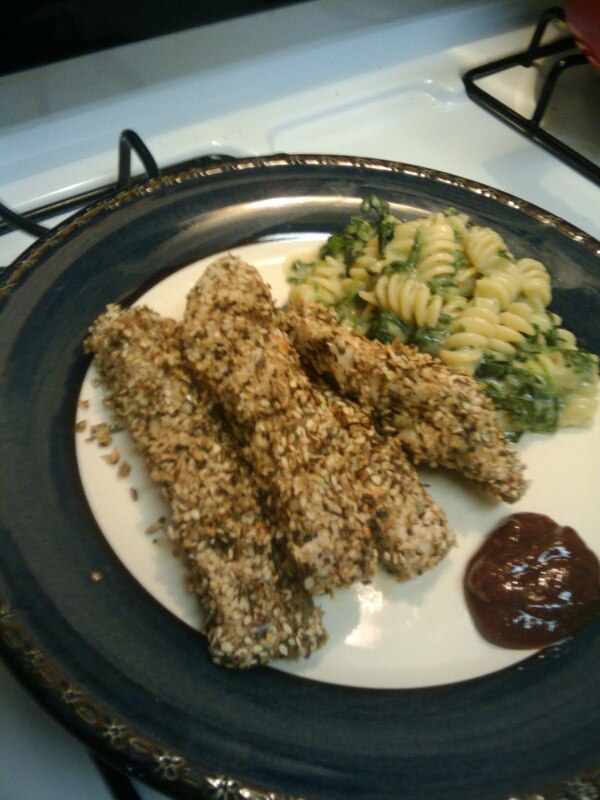 *If you can’t find chicken tenders at your grocer, cut 2 breasts into 4 or 5 strips each.